‘The Promise’ is the latest book by Katerina Diamond. When a young woman is found strangled in her own bedroom, DS Imogen Grey and DS Adrian Miles are plunged into an investigation to find a twisted serial killer who likes to date his victims before he kills them. Determined to stop the horrific deaths, Imogen is forced to act as bait – but will she get caught in her own trap? As the search for the killer ramps up, attention falls on the strange new boy in town. Why does he watch his neighbours through the windows? And could the truth be closer to home than any of them realise? I’m a huge fan of Katerina’s writing, her books are always chilling and twisted that make for shocking and haunting reading. In this book, the detective duo Adrian Miles and Imogen Grey are still reeling from their last case, when Imogen’s relationship fell apart and Adrian’s new girlfriend was murdered and they aren’t given much time to catch their breath before a new killing spree starts. When a young woman is murdered, it’s immediately suspicious the way the body is left as well has her phone being taken. As well as trying to solve the murders and catch the killer before the body count is getting higher, Imogen finds herself taking part in online games and dating hoping to trap the killer. The story is seen through the narrative of both Adrian and Imogen as they both try to move on with their lives. Both hurt and alone, they find solace in each other’s pain and find the lines of their relationship being blurred. There’s also the inclusion of smaller sub stories that are weaved throughout the main plot, which make the story gripping as well as giving the reader the opportunity to figure out the killer before the detective duo. Connor has moved to England with his alcoholic father after living in America hoping to make a lives for themselves after the tragedy that they left behind. He’s troubled young teen that the pupils of his school are fascinated with, but he’d rather be left alone and deal with his demons. There’s another story where the narrator is unknown stuck in an abusive relationship that she’s trying to escape. In Katerina’s true form, the story is gripping and chilling with gruesome reading that does make the reader pause and reflect. With clever writing, suspicious characters and a roller coaster of a plot, ‘The Promise’ is a thrilling crime novel that leaves the reader on the edge of their seat! 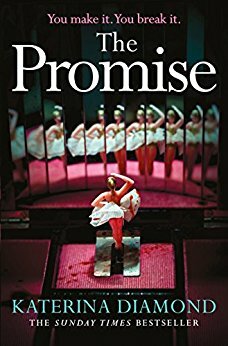 You can buy The Promise from Amazon and is available to buy from good bookshops.